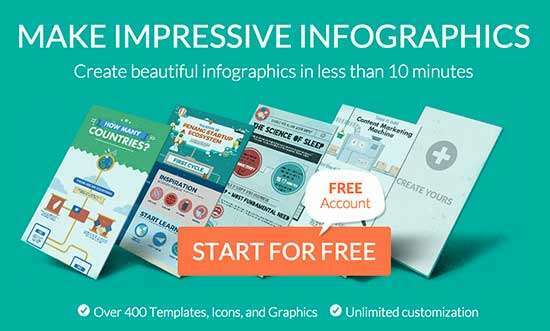 Want to use easy Infographic Template Tools to create stunning infographics… but don’t know where to start? Infographics are a proven way to attract attention and traffic to your website over many years. In this post I share 4 Infographic Template Tools for creating infographics easily and quickly… even if you are not a designer. For many years now I have been a big fan of infographics. 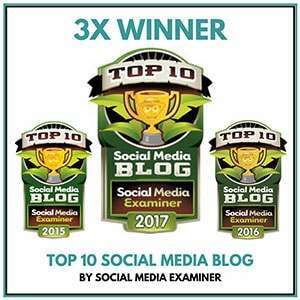 Since 2012 we have created many infographics for blog posts on my Socially Sorted blog, as well as for guest posts, and for clients. 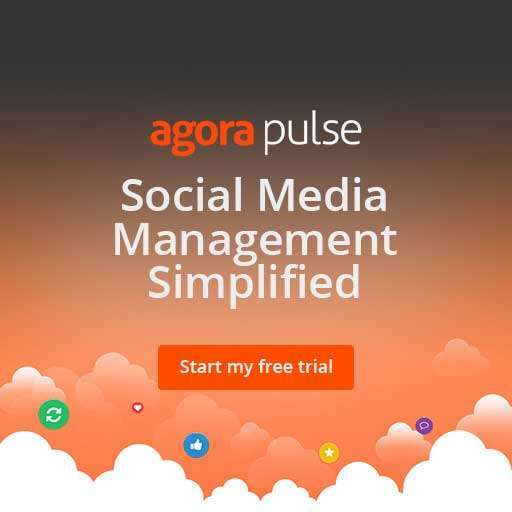 Many have attracted tens of thousands of shares like this one for Razor Social. Or this one on my blog. Many of our infographics have been featured on sites like HubSpot and Entrepreneur. These infographics get shared every day to Pinterest, even 3 or 4 years after they were first posted. 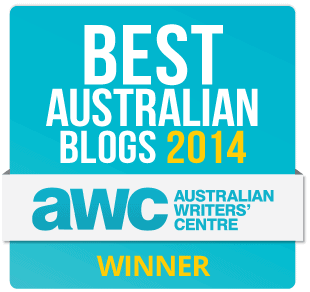 That’s tens of thousands of shares and 100s of re-blogs on other sites. When was the last time you could say that about your posts on Twitter or Facebook or Instagram? What if you don’t have a design team to create an infographic for you? Can I let you in on a little secret? Although I have had illustrators and designers on my team, I have also created many of my own infographics. 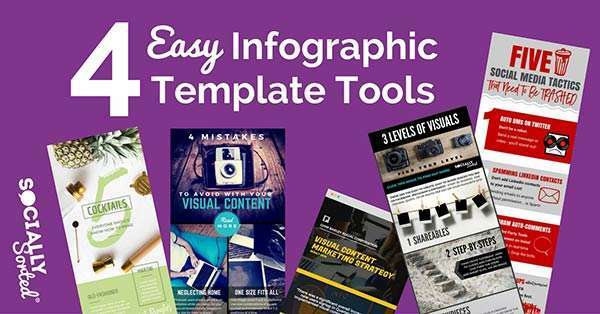 It’s not that difficult if you have a great infographic template tool – like the tools I am about to show you. You see, in the past 3 years, soooooo many more options have become available to us compared to what we had before. All you need is a great infographic template – like the ones I am about to show you… and the right infographic content and strategy. 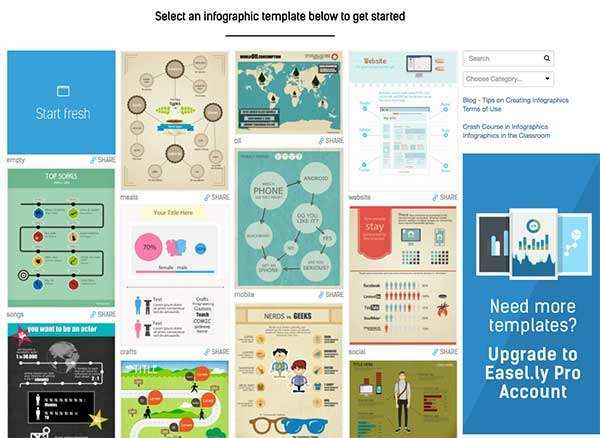 These infographic template tools will become your secret weapons. With or without a designer, you can create shareable images – infographics – of any size that drive traffic back to your website. 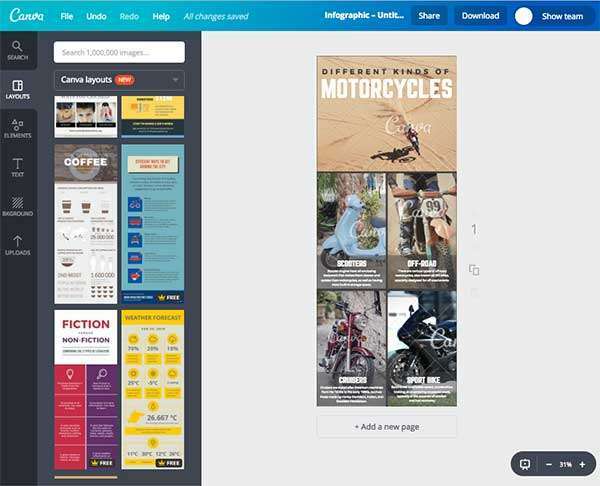 All of these tools allow you to easily create your own infographics by simply switching out images, background photos, text and fonts. They all start with a “free” account and you can upgrade for more features or template designs. You can also customize your designs as much as you want, but at their simplest, all that is required is a simple content switch, and boom!…..you have yourself a classy, custom infographic! 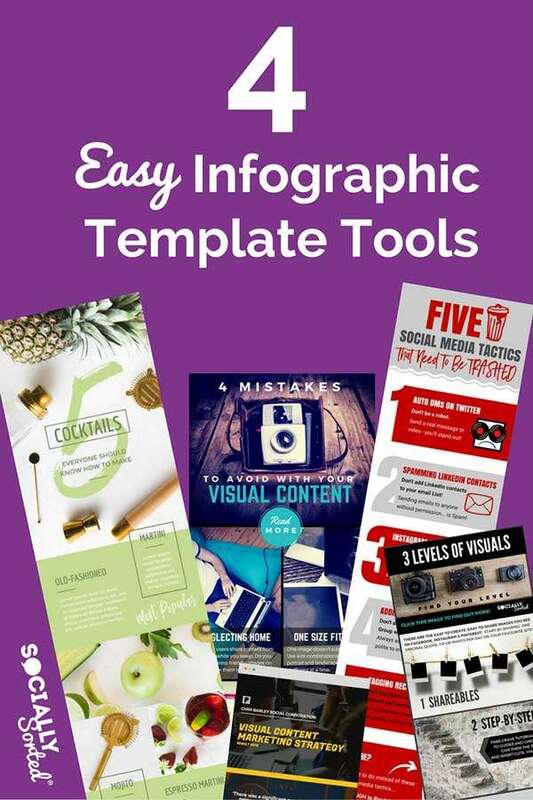 Canva has had an infographic template series for a while as part of their free and paid user tools. Their infographics are not super long, which is great as they share easily on blogs, Facbebook, Twitter, as well as Pinterest of course. They are about 2000 pixels long (many traditional pixels are about 5000 pixels long). I actually like that they are shorter in length. They are long enough to catch attention, but compact enough to be processed easily and quickly. As you can see, the “Motorcycles” template is made up of images. I can easily switch out the images and the text to create something entirely different. Check out this blog post to see what I was able to create using the infographic template above. You can also add your business or website details including URL or Logo to the bottom of many of the infographic templates. This is a new feature and I’m pleased that they have added it. Easil is a new kid on the block when it comes to infographics and shareable images for Pinterest but I LOVE it. I wrote about Easil here and here. You can check out their infographic templates here. Easil’s infographics are not super long, about 1800 pixels long (many traditional pixels are about 5000 pixels long) which I love! Here’s a few of their designs to cast your eyes over … funky, right? Easil’s Infographic Templates are funky and fresh! Here’s an infographic I created using an Easil Infographic Template for this post. It took me about 25 minutes to create. Easil also has regular size Pinterest-images as part of their social media template range. Easil is a visual content playground and they have a free version of their tool, so you can get started straight away. 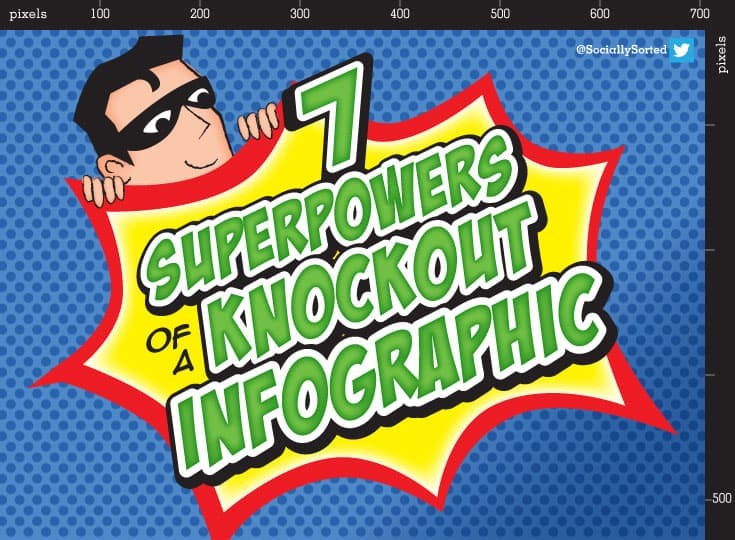 Piktochart has been a long-standing winner when it comes to infographic templates. It’s what they do – infographics. 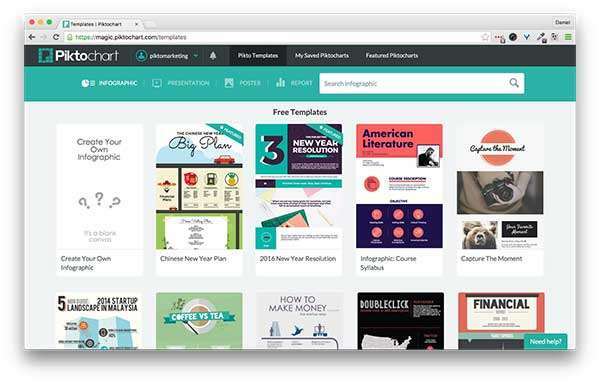 They have one of the largest libraries of templates out there, so if you are in the market for DIY infographics, sign up for a Piktochart account. Also take note that Piktochart has expanded their templates to include Presentation templates. These are designed so that they can be saved as an infographic or shared as a presentation. 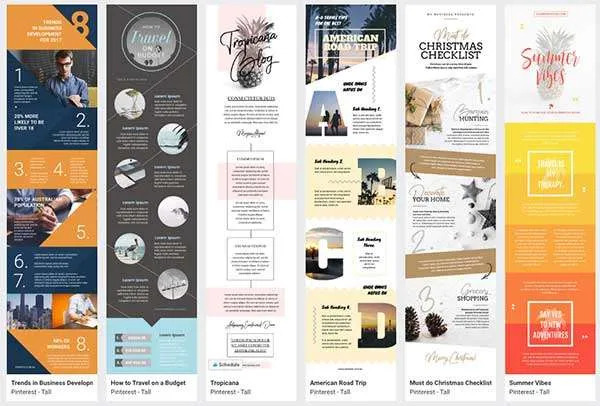 Easel.ly (not to be confused with Easil which is a different tool) is another option for creating infographics with plenty of infographic template options. You can re-use several thousand infographics for free within the platform so it’s super simple to get started. 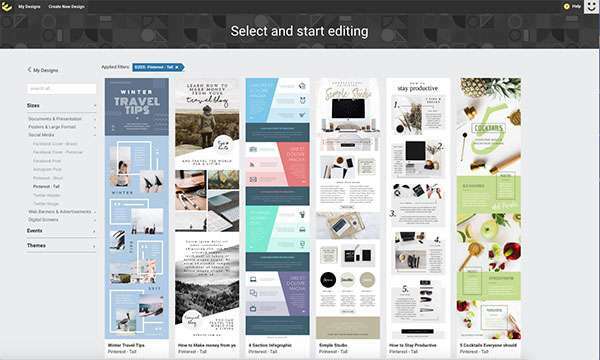 Better still, you can either re-use templates or create from scratch with their comprehensive infographic builder. You can upgrade easily for a reasonable cost to use their pro account (from as little as $3 per month) to access thousands more images, templates, fonts and elements. It’s the perfect mix to allow both beginner’s and savvy infographic creators play in the sand box! Are you creating shareable images on your major blog posts? These four infographic template tools can get you started – quickly and easily. Which one will you try first? Let me know in the comments below.